On a recent visit to the area with the onset of winter and the dying off of the brambles and weeds several other building remains were to be found. 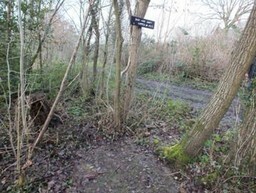 It is well worth a visit to this site for a pleasant walk in woodland surroundings. (Take your Wellingtons though as it can be very wet underfoot). Opening of a New Colliery at Unstone. 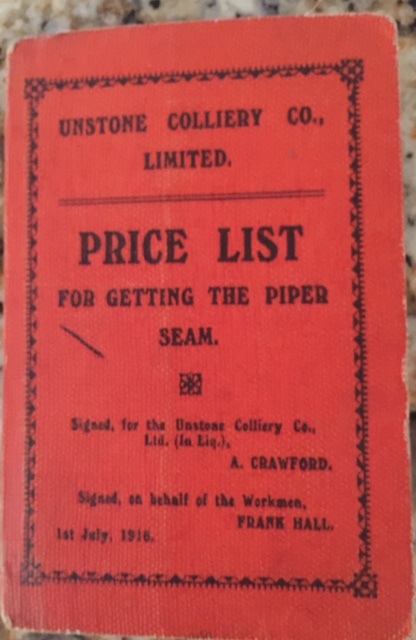 On Tuesday last the first sod of a new pit belonging to the Unstone Coal and Coke Company was turned by Miss Harrison daughter of Captain Harrison of Rotherham. 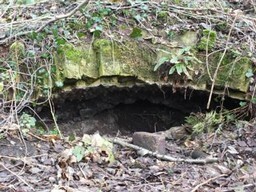 The place for sinking the new shaft is in a field adjoining Unstone Mill and is about 100 yards from the turnpike road leading from Chesterfield to Dronfield. It is on the slope of a hill and lies very convenient for the fall of water and for tipping dirt as it comes out of the pit. 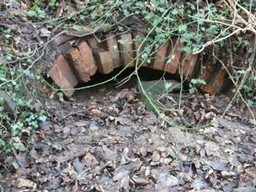 The shaft is twelve feet clear and will run 100 to 200 yards down to the Blackshale. To Railway Contractors the Unstone Coal and Coke Company are desirous of receiving tenders for the construction of the branch railway and sidings. Plans and specifications may be inspected at West Staveley Colliery offices. 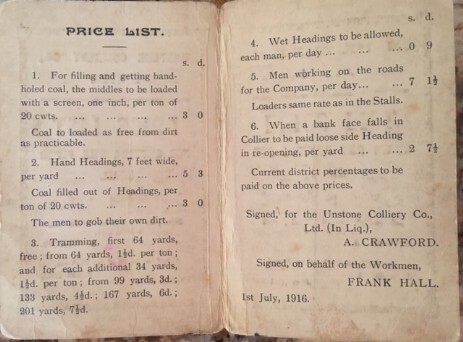 The Unstone Coal and Coke Company LTD consequent on the closure of their pits will sell by auction on 21st April 50 pit ponies in a field near the colliery. 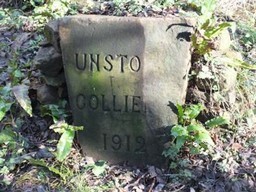 Unstone; a Warning to Colliers. At Eckington Petty Sessions John Gabbitas a collier at Unstone was summoned at the instance of the Unstone Coal and Coke Company for unlawfully contravening the 2nd 72nd special colliery rule of not having set sufficient 'sprags' before commencing holing on the 2nd of November. The prosecution said it was a very serious offence. The man had not set a 'sprag' in his stall within seven yards and he had actually holed 2 feet six inches under. The bench were no doubt perfectly aware that the limit for setting 'sprags' was six feet. It was a miracle that the man was not killed on the spot, it actually made the deputy tremble when he saw the stall. The company did not want to press the case but simply wanted an example made for others. The defendant who pleaded guilty was fined £1 plus costs or in default 14 days. 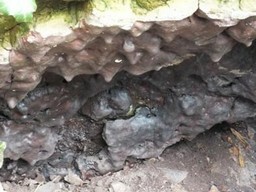 James Higginbottom a collier of Unstone was charged with a similar offence. This was also a serious case the defendant worked in number one stall and he had holed for a distance of six yards without having set a 'sprag' and he had gone one foot under. It was not as bad as the previous case. The defendant pleaded guilty and afterwards said that he had set a 'sprag' but he took them down as he had a right to do in order that the coal might fall so that he could fill a tub which was waiting. The bench said that the defendant had made his own case worse than it would have been and he would have to pay a fine of £1 plus costs or 14 days in default. Dronfield Colliers in Trouble; a Warning. On Monday at the Dronfield Petty Sessions before W.F. 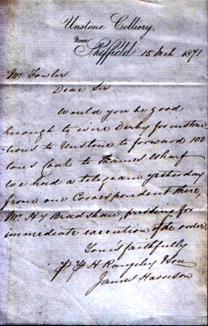 Bagshawe and W.J. Blake esq. William Gilbert, Alexander Ready, Herbert Clarke, William Baker, Thomas Higginbottom, George Daykin and James Goodall all of Dronfield and William Wright of Apperknowle were summoned by the Unstone Coal and Coke Company for breach of contract. The prosecutor said all the men employed by the Unstone Coal and Coke company had signed the usual contract rules of which 14 days notice must be given on either side before they could terminate the agreement. The defendants had been absent from their work from 2 to 7 days. It was a very serious matter for the company when they absented themselves from their work as they sustained a loss of 9/8d for every man who stayed away. The compensation was based on 5/- per day and the company claimed from Gilbert that he had been away from work for three days 15/-, Daykin 5/-, Wright 10/-, Higginbottom 15/-, Clarke 10/-, Baker and Goodall 25/- each and Ready 10/-. The Prosecutor went on to say that the company gave the men 5 days holiday at Christmas. The defendants did not consider this sufficient holiday and they failed to go to work on the days mentioned on the summons. All the defendants admitted being away from work on the days specified but several intimated to the bench that the company had claimed more than they could earning a day. The bench ordered them to pay the compensation and costs and they hoped that it would act as a deterrent not only to the defendants but to others as well. 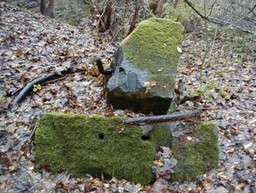 Unstone Colliery to be Sold. The Silkstone Colliery Unstone is to be sold by tender comprising of about forty five acres of which only five acres have been worked. 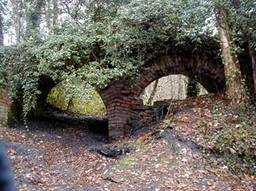 The coal is known as the Blackshale or Silkstone of superior quality about five feet in thickness. 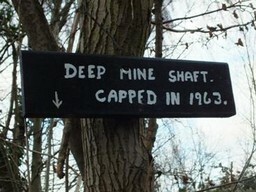 The shaft is sixty four yards deep and is worked by a fourteen horse power engine. There are two ovens for making hard coke and one for soft or smiths coke. To be sold by auction a winding engine 12 inch cylinder-2 foot 8 inch stroke, link motion 8 feet 5 inch flywheel by Plowright Brothers of Brampton. Fan engine 8 inch cylinder 18 inch stroke by Plowright Brothers. One end boiler 27 foot x 4 foot by Oliver and Company Chesterfield. Messer’s. 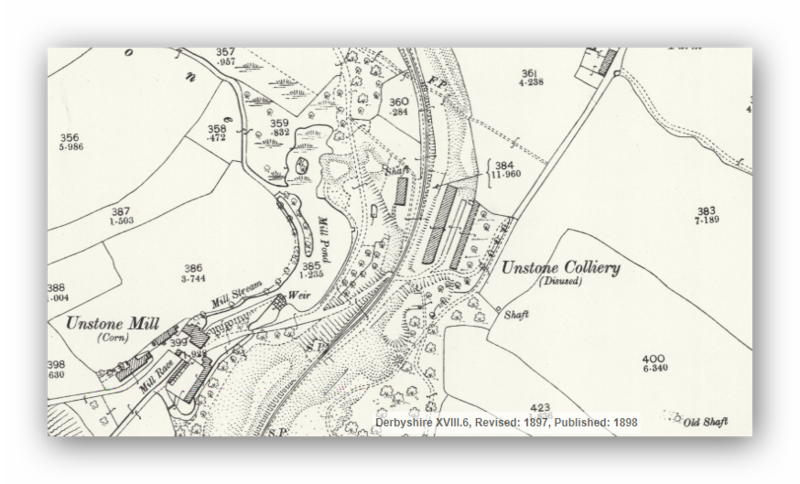 J. Rhodes and Sons Unstone Colliery Sinking Update. The new colliery of Messer’s. J. Rhodes and Sons at Unstone. This colliery the first sod of which was turned in March last year has begun to assume proportions indicative of this great importance in the neighbourhood. Two shafts have now attained a depth of 85 yards and 45 yards having been through very strong rock conditions. The influx of water became so great after the first heavy downpour of rain in the summer that the sinking operation had to be suspended pending the erection of a Cornish engine of 200 horse power which will be able to lift with ease 1000 gallons of water per minute. The erection of the engine will of course occupy some considerable time and some months will no doubt elapse before they have reached the famed Silkstone Bed of coal. Thirty yards have yet to be delved out. A branch line of railway will be made to join the Midland the distance being about half a mile. The coalfield is said to comprise 300 acres and for its development a great number of hands will be employed at the colliery in no small degree to the prosperity of the neighbourhood. It is very creditable to the officials at the works that so far no serious accident has occurred. 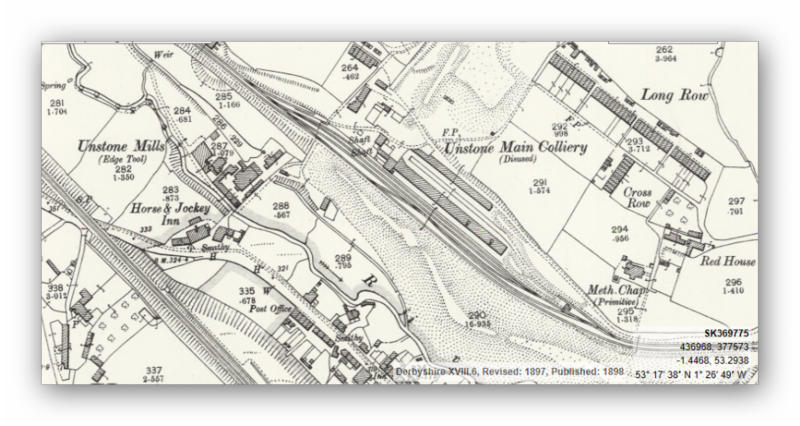 The valuable seam of coal known as the Blackshale or Silkstone and under 180 acres of land situated at Dronfield adjoining the main line of the Midland Railway has just been purchased by the Unstone Coal and Coke Company. The company will take possession in the course of the week and it is intended to develop a coalfield commensurate with that of the Moor Top Colliery near Unstone belonging to the same company. Plans for a sidings have already been approved by the Midland Railway Company which will be on an extensive scale and but a short distance from the railway station and near to the spade and shovel works of Messrs. E. Lucas and Sons. From James Harrison to Mr. Fowler. His Grandad Thomas Henry Mullins died at Glapwell on 22 February, 1935 (he was walking out and forget something ran back and the there was a pit collapse and he was dead by the time he was dug out). If you could add this death to the death/accident section, that would be much appreciated. Many thanks Matt for the information.